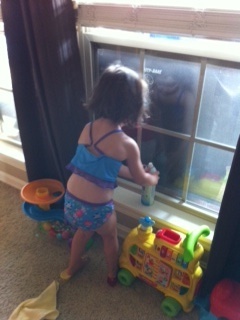 I have a confession...I have a housekeeper. I love her. She does a better job than I can pretend and can get this house squeaky clean in a few hours where it would take me a week to get it picked up. I have had Kari for a few years. Kari came to the family soon after we moved in. I was working full time and thought it would be nice to have. Then I got pregnant with twins and she became a lifesaver and necessity. I quit my job almost a year ago, but held onto Kari. I just can't part with her. Not only does she do a fantastic job, but I'm pretty sure she is a saint. Diva loves her. She is always going around pretending she is Kari. I shared this with Kari a while back. She thought it was sweet. Anytime Diva is home Kari lets her help her. Of course this slows Kari's pace down, but it means the world to Diva. Kari always gives her a job in each room they are in. Today was no different. It was Kari day and Diva wanted to help. Diva was in rare form today and had ordered me out of the room so they could clean. When I left the room Diva was wearing a ridiculous satin robe and high heels to clean in. I walked through a little bit later and Diva was wearing an old swim suit. No joke. 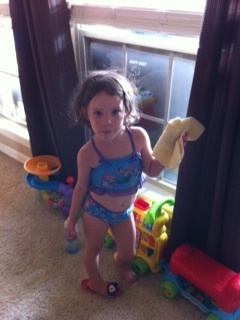 She felt the appropriate cleaning attire was a swim suit. I mean, doesn't everyone clean like that? I took a couple of pictures.